With someone like George Skouras, a man who has been such a prominent force in the Greek wine industry, it’s hard to imagine him as a young twenty-something, crushing his first vintage of wine. Especially because 27 years ago, few would have predicted that there would be a thriving Greek wine industry in 2011. But thanks, in part, to the efforts of Skouras and several other pioneering winemakers, the foundations that were laid in the early 1980’s have led to a thriving and dynamic industry that is making excellent wine. “I had no idea I was going to become a winemaker,” said the genial Skouras, as we sipped Moschofilero on the covered patio of his winery on a sunny afternoon in June. Skouras went on to study at the University of Dijon, getting a degree in viticulture and enology, and getting the opportunity to work in the vineyards of Burgundy, Bordeaux , Champagne, Beaujolais and more. Skouras returned to Greece in 1982 to work for Nicholas Cosmetatos at his winery Gentilini, a pioneering effort that many consider the beginning of the modern winemaking movement in Greece. By 1986 he was ready to do something on his own. Now, such blends are common, but at the time, most of the international grape varieties and the indigenous varieties were kept and made separately. Once Skouras had made his first wine, then he had to sell it. Within a few years, Skouras matured his skills as a marketer as fast as he had matured his skills as a winemaker, holding press conferences and setting up tastings for members of the press. Like several other French trained winemakers who all returned to Greece to make wine at around the same time, Skouras rapidly rose to prominence and acclaim. Domaine Skouras now consists of 80 acres of vineyards, many of them older vineyard sites that Skouras purchased near his home town in Malandreni, where his flagship winery sits, about an hour and a half from Athens. This was his second winery, however, as his first venture was a small winery in Gymno in the Nemea region, the area of the Peloponnese peninsula synonymous with the grape Agiorgitiko. The winery produces northwards of 50,000 cases of wine a year, across a wide range of bottlings, some of which are as small as a few thousand bottles. 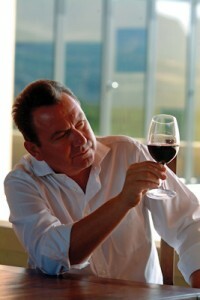 While Skouras is actively involved in the day-to-day operations, he now has a winery team of very competent individuals that handle most of the production, giving him time to represent both the winery and the Greek wine industry as a whole (Skouras was Vice President of the Greek Wine Federation for some time). After nearly 30 years in the vineyards and cellar, Skouras shows very little sign of slowing down. Skouras’ passion for what he does is easily seen in his manner, but equally in his wines, which were among some of the highest quality that I tasted while I was in Greece. As impressed as I was by his story, and his impressive contribution to a complete revitalization of the Greek wine industry, I was deeply impressed by his wines, which showed a competence and finesse that belied the size of his operations. Here’s the lineup of wines we tasted through in his cellars on my recent press trip to Greece. Pale gold in the glass, this wine smells of green apple, and white flowers with a touch of wet chalkboard. In the mouth the wine offers bright green apple and lime zest flavors with notes of white flowers and wet stones. Crisp and juicy with racy acidity, the wine has a brisk finish. A blend of 30% Moschofilero and 70% Roditis. 12% alcohol. Score: around 8.5. Cost: $10. Palest greenish gold in the glass, this wine smells of grapefruit zest and wet stones. In the mouth the wine offers crisp and bright flavors of green apple and wet stones. Nice texture and excellent acidity hold through a finish of green apple and white flowers. 12% alcohol. Score: between 8.5 and 9. Cost: $15. Light yellow gold in color, this wine smells of dried apricots and wet stones with hints of wet seaweed. In the mouth the wine offers quite stellar acidity (for this grape variety) with bright flavors of unripe peaches and wet stones. A long clean finish of tart mandarin zest lingers on the back of the palate. Fermented with native yeasts. 13.5% alcohol. Score: around 9. Cost: $20. Light gold in color, this wine smells of lemon curd, sea air, and toasted, buttered bread. In the mouth the wine has a mouthwatering saline quality with flavors of lemon curd, and a hint of toasted oak and cold cream. 70% of the wine is vinified without malolactic fermentation in steel, while 30% is fermented in oak with full malolactic fermentation and then spends 6 months in 100% new oak. “Almyra” means “salty” because the vineyards are close to the sea and tend to pick up some salt from the air. Made from the Chardonnay Musque clone. 13% alcohol. Score: between 8.5 and 9. Cost: $16. Light to medium yellow-gold in the glass, this wine smells of buttered, grilled peaches. In the mouth the wine offers slightly salty flavors of peaches, lemon curd, and wet stones. Very concentrated, but with excellent acidity and a wonderful silky texture, the wine lingers for a long time in the mouth. Quite unusual for a Viognier and distinctive in its own right. The wine sees extensive lees contact, and quite unorthodox farming techniques (including breaking the stems of the bunches prior to harvest in order to artificially drive ripening because the grapes won’t ripen on their own due to a mistake in where the vineyard was planted). 13.5% alcohol. Score: around 9. Not exported. Light yellow-gold in the glass, this wine smells of salty buttered toast and lemon cream. In the mouth, the wine offers juicy lemon and toasted, buttered sourdough flavors. Softer acidity and slight alcoholic heat linger on the finish, but the wine has a nice balanced and good texture, and is quite mouthwatering. This wine’s 2001 bottling was the first wine closed with a screwcap in Greece. “Dum vinum sperum” is the name of a a small parcel of Chardonnay Musque in rocky volcanic soil. Fermented with native yeasts. Not exported. 13.5% alcohol. Score: between 8.5 and 9. Light, bright ruby pink in the glass, this wine smells of bright red berries and watermelon. In the mouth the wine is juicy and bright with excellent acidity and flavors of strawberry and cherry that have a clean, rainwater fresh minerality that lingers for a long time on the palate. Fantastic. The wine is a blend of 70% Agiorgitiko and 30% Moschofilero, cofermented. 12% alcohol. Score: around 9. Cost: $12. Medium garnet in the glass, this wine has a nose of wet stones and red berry aromas. In the mouth, flavors of red berries, wet stones, and hints of citrus zest bounce around in a velvet lined box of tannins. Hints of bitterness on the finish. Excellent acidity, but somehow the wine doesn’t really hang together. Includes 10% Cabernet Sauvignon. 30% of the Agiorgitiko undergoes carbonic maceration, the rest ferments normally. 13.5% alcohol. Score: between 8 and 8.5 Cost: $10. Medium garnet in the glass, this wine smells of brown sugar and mulberry fruit with hints of cherry. In the mouth the wine offers a slightly salty package of juicy mulberry and plum flavors with hints of milk chocolate and fleur de sel on the finish. Juicy, with faint, velvety tannins and a moderate, citrusy finish. Fermented in used oak, and aged for about 12 months. Score: around 9. Cost: $14. Dark garnet in the glass, this wine smells of dark mulberry and cherry aromas mixed with sweet oak aromas and a hint of fennel seeds. In the mouth, leathery tannins wrap around an unbelievably juicy core of cherry and mulberry fruit that is tinged with root beer and celery, layered with sweet oak. Perhaps just a touch too much oak, but hard to fault it, as it is quite well integrated. Fantastic acidity and quite unusual in character. The Agiorgitiko grapes used to make this wine are at the highest planted elevation in the Peloponnese at roughly 3300 feet in altitude. 13.5% alcohol. Score: between 8.5 and 9. Cost: $28. Dark garnet in color, this wine smells of dark plum and spicy mexican chocolate mixed with a deep wet stone minerality. In the mouth, juicy acidity drives flavors of plum and chocolate into a matrix of leathery tannins. Citrus oil high notes mix with undertones of leather and a strong vanilla aroma lingers in the finish. Stunning, and certainly one of the best red wines I’ve ever had from Greece. With the acidity and tannins of this wine, it will likely last a long time. Best drunk starting in 2013. A blend of 80% Agiorgitiko and 20% Cabernet Sauvignon. 3000 cases made. 13.5% alcohol. Score: between 9 and 9.5. Cost: $28. Dark garnet in color, this wine smells of oiled leather and cherries with notes of chocolate and black olives. In the mouth, flavors of black olive, chocolate, cherries, and a meaty quality make this an irresistible mouthful. Wonderful acidity makes this wine quite bouncy and juicy, while velvety tannins give muscle and structure to the wine. Synaro means “border” and it refers to the border between the three vineyards that contribute grapes to this blend of 40% Cabernet Franc, 40% Merlot, and 20% Agiorgitiko. The synergy between these three grapes is quite intense and beautiful. A remarkable wine, and one of the best I’ve had from Greece. 14.3% alcohol. Score: between 9 and 9.5. Cost: $30. Dark garnet in the glass, this wine smells of saddle leather, cherry, smoldering cedar, and dozens of other indescribable smells. In the mouth, the wine has deep, almost bottomless velvety tannins in which flavors of cherry, chocolate, cedar, and burning leather all swirl against a backdrop of wet chalkboard and woodsmoke. At this point I should stop throwing adjectives around and say it is one of the more unique red wines I’ve tasted. Made from a solera-style, single barrel blend of vintages from 1999 to 2005, hence the name. 80% Agiorgitiko and 20% Cabernet Sauvignon. 13% alcohol. Score: around 9. Not exported.